Bowls may lose their corporate sponsors. For college football purists, the wretched economy could offer a blessing; corporate sponsors may start dropping their names from the once-hallowed bowl games. Granted, no announcements have yet been made by Sheraton, Brut, Pacific Life or others about future plans for the bowls they back. But given the detritus on the sports sponsorship landscape in the latter half of 2008 – where the Big Three are pulling money out of their beloved NASCAR and a healthy company such as Johnson & Johnson decided not to renew an International Olympic Committee sponsorship – there is no doubt companies tied to bowls must reassess their commitment. Millions of dollars are at stake during the annual games. 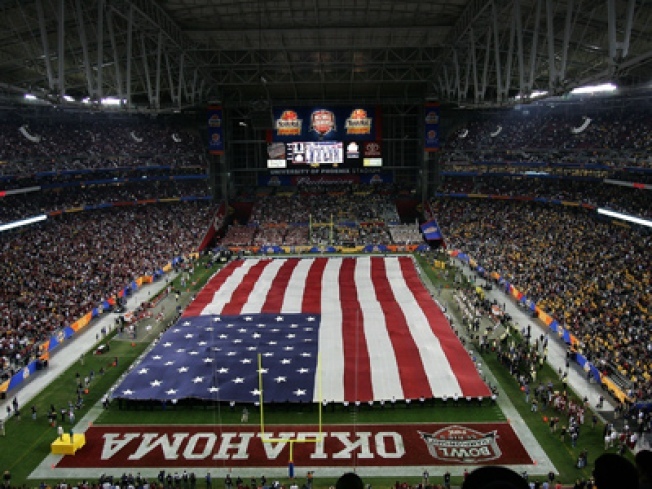 The lower-level bowls all receive six-figure paychecks for naming rights, while the BCS bowls in January are said to cost outfits such as FedEx and Tostitos anywhere from $5 million to $6 million a year. But corporations – especially those backing the more than two dozen lesser bowls – must wrestle with a number of issues as contracts expire. As the number of bowls increase (34 will be played this season, as opposed to 18 when the likes of Doug Flutie and Bo Jackson ruled the field), the value of sponsoring one diminishes. The more bowls there are, the less chance viewers will choose to watch, say, the Konica Minolta Gator Bowl. And with the popularity of the Bowl Championship Series and its five must-see games – four of which ESPN agreed to broadcast starting in 2011 at a whopping $125 million a year – inferior bowls have lost some cachet. company magicJack, which agreed to pay for naming rights to the new St. Petersburg Bowl that debuted last week, may be a one-and-out; its deal lasted only for that game. Certain sponsors are in worse shape than others. Though President Bush offered a $17.4 billion bailout for ailing auto companies last week, there’s no guarantee that GMAC and AutoZone – already battered by the Big 3’s woes – will want to dedicate precious cash to keep their names on games in Mobile, Ala. and Memphis. Still, 30 of 34 bowl games are sponsored because companies see value in the enterprise. In the stadiums, corporations put patches on the player uniforms and advertisements on the walls. Best of all in their mind, company logos grace the turf, usually around the 20s and at midfield. And even if few alums and others fill the stands – a number of bowls can’t even draw 40,000 – corporate sponsors procure a national television audience, usually on ESPN or ESPN2. Even the lowliest bowl games can draw millions to watch at least part of the action and be exposed to the company pitch, which is especially crucial for firms angling for name recognition. Not so long ago, it was unheard of for a bowl game to be affiliated with corporate America. Back in the mid-1980s, the bowls were typically named after fruit or flowers. Then Sunkist decided to slap its name on the Fiesta Bowl while John Hancock sponsored the Sun Bowl. By the 1990s, the lion’s share of bowl games boasted a corporate sponsor. Today, the vast majority are backed by a business, though the Texas Bowl and a few others are independent this year. During these battles, the key for companies is to get their message across. That’s easier for some than for others. The former Gaylord Hotels Music City Bowl Presented by Bridgestone was such a confusing marketing ploy that it was better to just switch the channel. And will business really pick up because a game is called the San Diego County Credit Union Poinsettia Bowl, especially when the draw is Boise State and TCU? Whatever the case, this much is clear: With a lengthy recession on tap, some companies may decide that, rather than spend the holidays at a bowl game next year, it may be time for their sponsorship to take a holiday.